WLP Testified in Opposition to HB 861, Preemption of Local Labor Protections | Come Check out Our NEW Site! 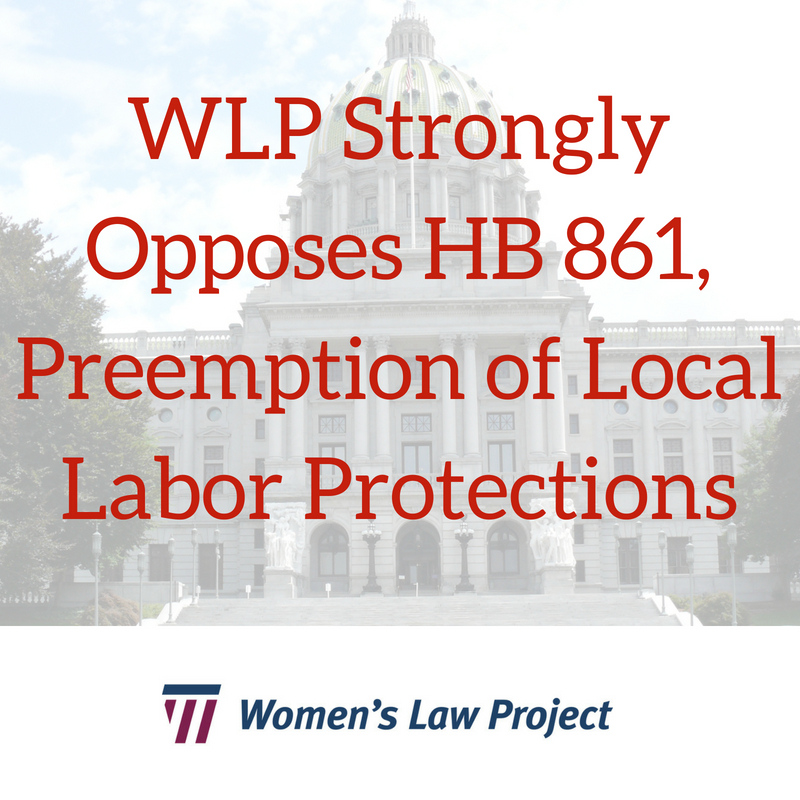 Today, WLP Staff Attorney Amal M. Bass testified in opposition to House Bill 861 (preemption of local laws protecting workers) before the Pennsylvania House Labor & Industry Committee. The Women’s Law Project strongly opposes HB 861, which is sponsored by Rep. Seth Groves of York County. You can read Amal’s testimony in full here. Preemption bills like HB 861 prohibit local governments from passing local ordinances to meet the needs and reflect the values of their own communities. HB 861 is even worse than a typical state preemption bill because it includes a retroactivity clause designed to strip away local protections that have already been implemented, including protections for LGBTQ workers and paid sick days ordinances that provide protections for victims of sexual assault and domestic violence. The way it is written, HB 861 could apply to almost any local government’s attempt to protect its own workers. HB 861 would retroactively strip hundreds of thousands of Pennsylvania workers of their right to paid sick days. The Women’s Law Project testified in support of Philadelphia’s paid sick days ordinance, which City Council passed and the Mayor signed on February 12, 2015 after a thorough, multi-year process that drew upon the recommendations of a Task Force representing many perspectives on the issue, including employers. The local law that resulted from this process provides forty hours of earned paid sick time in a calendar year for workers of employers with ten or more employees, and it provides unpaid sick time to workers of smaller employers. Philadelphia’s paid sick days ordinance also provides paid leave to employees whose absence is related to domestic violence, sexual assault, or stalking. This ordinance is vital for the health and well-being of women and their families in Philadelphia and the surrounding counties, giving paid sick leave to more than 200,000 workers. In 2015, Pittsburgh joined Philadelphia in recognizing these benefits when it used its home rule authority and its authority to pass public health laws to pass a modest earned paid sick leave ordinance. The Women’s Law Project and attorneys from the Partnership for Working Families filed a friend-of-the-court brief in support of Pittsburgh’s paid sick days law on behalf of fifty-one organizations committed to women’s health and safety. However, the Pennsylvania Restaurant and Lodging Association has challenged this local law, halting its implementation, in a lawsuit currently before the Pennsylvania Supreme Court. This is typical in that special-interest groups often seek to block and stall protections from workers so that they may profit from the lack of protections. That doesn’t mean lawmakers representing hard-working constituents should allow them to succeed. House Bill 861 also affects discrimination laws. More than forty municipalities in Pennsylvania have local ordinances prohibiting discrimination on the basis of many protected characteristics, including sexual orientation, which our employment laws at the state and federal levels, Title VII of the Civil Rights Act of 1964 and the Pennsylvania Human Relations Act, do not explicitly cover. HB 861 is equipped with a retroactive provision that could strip protections for LGBTQ workers passed places such as Ambler Borough, Bridgeport Borough, Carlisle, Dickson City, Mount Lebanon, Kennett Square Borough, Narberth Borough, Phoenixville, Royersford, Stroudsburg, and Wilkes-Barre. All of these municipalities passed anti-discrimination laws after 2015, and therefore could trigger HB 861’s retroactive preemption. The bill could also prohibit every municipality in the state from altering or adding to their antidiscrimination provisions in the future. Pennsylvania is a patchwork of worker protections in part due to the failure of the Pennsylvania Legislature to pass meaningful worker protections, despite overwhelming evidence of the need to do so. HB 861 would undo and prohibit progress at the local level, taking rights away from the citizens of Pennsylvania without filling the void with statewide legislation. Absurdly, an argument sometimes made for preemption is that Pennsylvania’s patchwork of protections is confusing. If Pennsylvania’s patchwork of protections is a problem, it should be solved by ensuring all Pennsylvania workers are treated fairly with state-level protections, not state-level efforts to nullify local protections. The Women’s Law Project is a public interest law center in Pennsylvania devoted to advancing the rights of women and girls. Sign up for WLP’s Action Alerts here. Follow us on twitter and like us on Facebook. This entry was posted in workplace equality. Bookmark the permalink.